This page may require cleanup to meet basic quality standards. You can help by modifying the article. The discussion page may contain useful suggestions. This page is for the rare 2004 re-release. 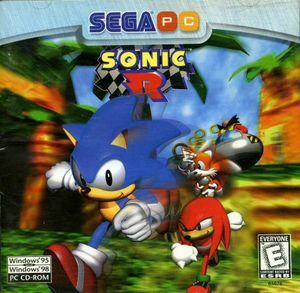 For the original 1998 release, see Sonic R (1998). Improved compatibility with newer operating systems with a larger modding community than the 1998 version. The network mode is almost completely removed. The graphics settings menu is made inaccessible and when manually accessed, many functions are disabled. Sonic Retro - A huge fan site for everything Sonic the Hedgehog. Use launch command "ignorecd" or install Sonic R Updater to bypass disc check. This game is not available digitally. This port is exceedingly rare and release information is poorly documented. It is currently thought that it has been released only in Portugal, UK and Australia. Copies of it are also not clearly labeled, instead appearing as a reprint of the original 1998 game. 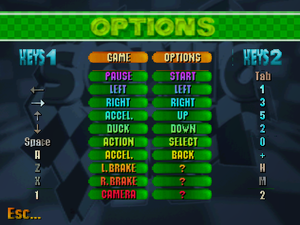 It is possible to upgrade the 1998 version to this 2004 re-release with by using Sonic R Updater. Fixes a runtime error that causes poor frame-rate on modern hardware, removes the disc check, adds modding support thanks to Sonic R Mod Loader, custom resolutions and widescreen support, windowed/borderless fullscreen modes, and loading music from the installation folder instead of the disc. Install Sonic R from the disc or copy the contents of the disc to a convenient location on your computer. Download Sonic R Updater from the link above or its Github page. Run sonic_r_updater_*.exe and follow its instructions. If the patcher does not auto-detect the game's installation folder, point it to <path-to-game> manually. 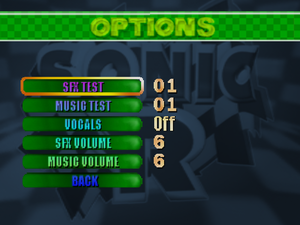 Adjust graphics settings from the Graphics tab of Sonic R Mod Loader and enable desired mods from the Mods tab, then click Save & Play to save your settings and launch the game. Some of the featured mods are included with Sonic R Updater. ADX Music - A mod to use more efficient looping ADX format audio for music instead, opting for improved version of tracks from the Sega Saturn version in some cases. RemoveStrays - A fix for various graphical bugs tied to how the game maps textures for the user interface. Sega Saturn Style Colors - A mod that fixes and restores vertex colors. This makes the game look more lively and colorful than it did before, as well as more accurate to the Saturn verion. Additionally it makes Radiant Emerald translucent like it's Saturn counterpart. EggRobo Texture Fix - Fixes a major texture goof where EggRobo's gun shows part of Tail's eye. Resort Island Fix - Fixes out-of-place floormaps of Resort Island. Gems Collection Textures - Ports over the textures featured in the Sonic Gems Collection version of the game. Music R - A mod that changes most if not all of the music in the game. Gentle Ring Sound - Replaces the loud and grating stock ring pick-up sound effect from the 2004 version that can cause audio clipping issues with a softer, sound-balanced one. Improved SFX - A sound effects enhancement mod that replaces the default sound effects with higher quality ones. Sonic 3D Blast Sounds - Replaces the default sound effects with ones from the Sega Saturn version of Sonic 3D Blast. Use Sonic R Updater for SSAA. Set display mode to Windowed Fullscreen, then select 2x Native resolution. Game is capped at 30 FPS. May not support all buttons in some cases. For XInput controllers, see Controller support. No controller or keyboard prompts whatsoever. To use XInput-based controllers, using XInput Plus is required. Download and run XInput Plus. Set the Target Program to Sonic R.exe. Go to the Key Assign tab, then go to Left Stick and assign it to Multiple Key, then check Left Stick and DPAD. Go to the DirectInput tab, and check Enable DirectInput Output, then go to its Advanced sub-section tab then click Detect under DeviceID to identify each controller for multiplayer by following the on-screen instructions. Click Customize, then assign Left/Right Trigger as Button 7/8, Back/Start as Button 9/10, Left/Right Stick Button as Button 11/12, and Guide button as Button 13. Click Apply to save settings and install DLLs into the installation folder. The game should be able to register XInput D-pad and analog triggers as DirectInput buttons. Music volume is new to the 2004 port. Game audio is always stereo. Sonic R Updater changes this so the music is audible when focus is lost due to bass_vgmstream support being added. Patch the game with Sonic R Updater. 7, 9 For Direct3D 9 support, install Sonic R Updater. Reportedly has unlimited draw distance valves compared to the 1998 version, however, increasing the draw distance above 6 can cause minor transparency graphical bugs with shield power-ups. Use F1 to decrease draw distance or F2 to increase it. ↑ 1.0 1.1 1.2 1.3 When running this game without Administrator elevation, activity in %PROGRAMFILES%, %PROGRAMFILES(X86)%, and %WINDIR% might be redirected to %LOCALAPPDATA%\VirtualStore\ (more details). This page was last edited on 11 April 2019, at 02:59.